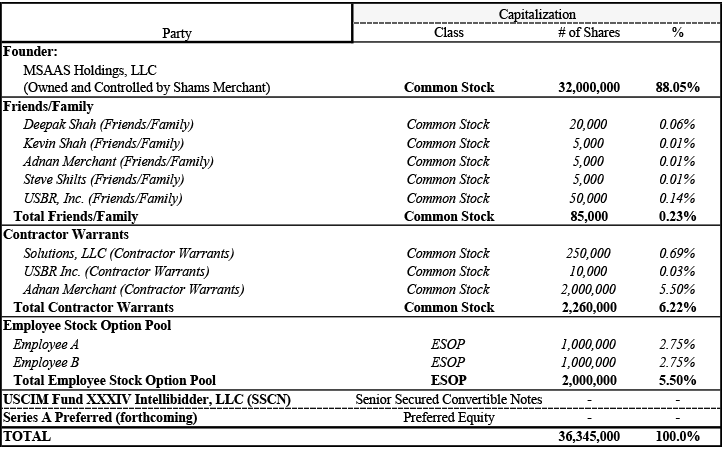 US Capital Global Securities, LLC (“USCGS”) is offering 80 Membership Units In USCIM Fund XXXIV Intellibidder, LLC (“Fund XXXIV”) a pooled investment vehicle, on a “best efforts” basis. The Fund XXXIV will be managed by San Francisco-based asset management firm US Capital Global Investment Management, LLC (“USCIM” or the “Manager”), investing in Senior Secured Convertible Notes of Intellibidder Corporation (“Intellibidder” or the “Company”). The Company plans to use the proceeds raised in this new offering to provide working capital to bring Company’s patent-pending technology services to market at scale and provide an opportunity for long-term growth through the acquisition of direct interests in Company Securities. Based in Dallas, TX, Intellibidder is developing a new proprietary and patent pending B2B e-commerce platform that facilitates the buying and selling of bulk commercial-grade general goods. Currently, popular B2B e-commerce systems, such as Alibaba and eBay, act as an open marketplace for buyers and sellers to connect. While productive, these systems are inefficient: buyers often do not receive optimal pricing and many sellers are left unable to participate and compete. The new Intellibidder platform is expected to have the advantage of aggregating supply, demand, and logistics, thereby delivering an optimum price-per-unit to purchasers as well as garnering significantly greater supplier participation. 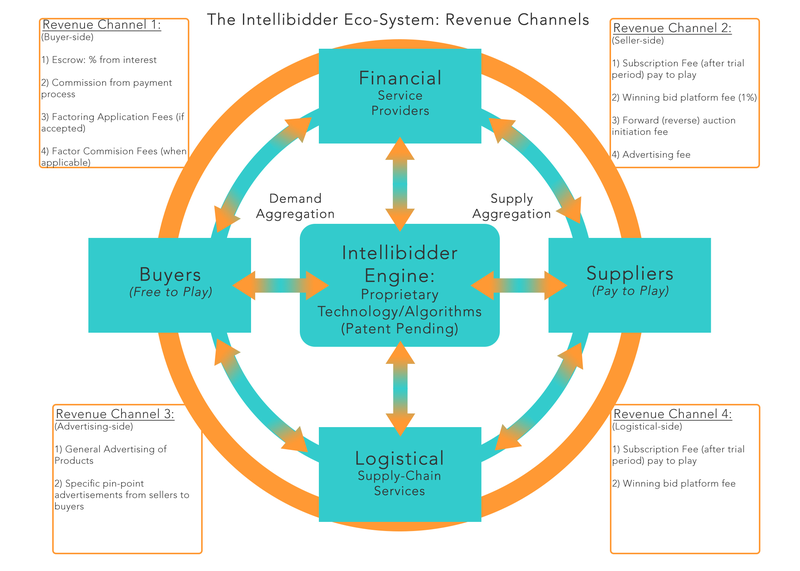 Intellibidder aims to be the world’s most intelligent B2B e-commerce system. Company’s Product Offering & Value Proposition. Intellibidder was founded to create its patent pending and visionary technology platform for use in business-to-business e-commerce. Intellibidder is unique in its method of aggregating multiple sources of demand to create economies of scale for greater purchasing power while at the same time, and with a novel approach, also aggregating multiple suppliers and logistics options for greater economic participation. 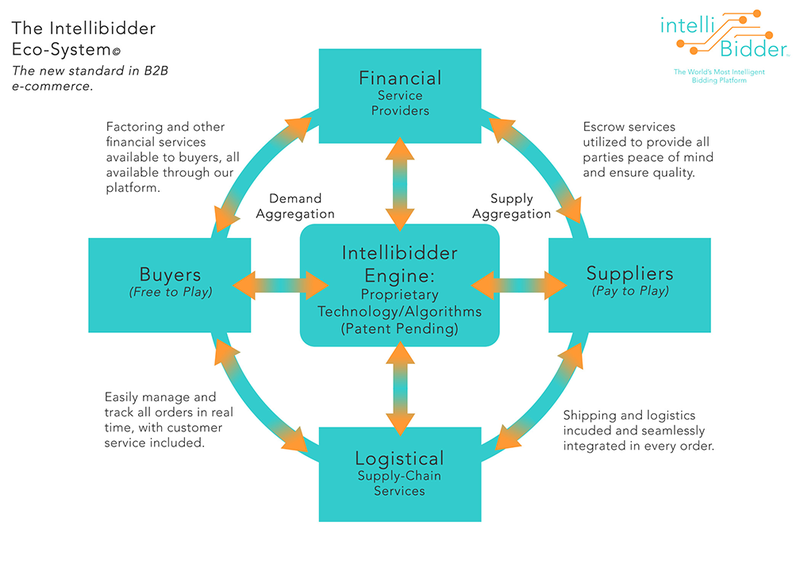 The Intellibidder Platform is applicable to virtually every B2B bulk-purchasing industry, world-wide. We organize our target market by industries, which include municipalities and other government entities, service and hospitality, manufacturing/construction, medical supplies, and many more. Such B2B e-commerce industries typically form associations comprised of large amounts of members. Key to growing the Intellibidder Platform is to engage with all respective industry associations to market our value. Because sellers and manufacturers tend to turn to where buyers are, we have made the platform free for buyers to utilize, thereby seeking to grow the platform’s userbase at an accelerated pace. Intellibidder’s revenue model aims to benefit from the four different channels it has identified: buyer-side revenues, seller-side revenues, logistical-side revenues, and internal advertising. The plan is that the platform will be free for buyers to use, while sellers will pay a nominal subscription fee. The platform plans to garner a nominal percentage as a transaction fee for each transaction. In addition, the platform expects to earn commissions on escrow, payment processing, factoring, and other services. In total, twelve separate revenue streams can possibly be derived from the four channels under design. As the platform grows, revenue growth is expected to increase alongside transaction volumes. The Company intends to use the proceeds raised in this new equity offering to finance the growth and development of the Company and its technology and deploying working capital towards marketing and business development initiatives, hiring additional employees, engaging premium consulting services, and developing operating infrastructure. (a)	Will be used to develop the prototype of the Intellibidder Technology Platform, ultimately leading to the entire system build. (b) Working capital to be used for general opertions and marketing (to obtain at least five separate Letters of Intent from interested parties). (d) 2 year reserve for management services and administration fees paid to USCIM (20K / year). Pro forma data are contingent to a successful and full completion of the proposed $2,000,000 Offering and execution by management team. Key risks are listed on page 4 which may impede the achievement of the forecasts and valuation appearing herein. 1. While Intellibidder plans to generate revenues in twelve different ways, these current projections are only based on three: 1) Seller subscriptions; 2) Transaction Fee (1%); and 3) Auction Posting Fee. This is because the remaining sources are commission-based and to be determined at a later date. However, and by far the largest driver of revenue is the Transaction Fee of 1% of the value of the total order process. Our very conservative estimates here are based upon the following assumptions: only 1-5% of buyers on the system will actually participate in a transaction, spending an average of $500-1500 in total, and only half the total number of transactions will complete in a given month. These numbers are also based upon conservative numbers of products offered on our platform as we continue to grow. 2. Includes development of prototype, full build, and continuing development. 3. We will seek premium consulting services for marketing and technical expertise. 4. Senior Secured Convertible Notes are expected to convert upon $9 Million Series A Financing in 2018. 5. Cash commissions of five and one-half percent (5.50%) on total raise of $11,000,000 and $35,000 in other fees. 6. The Board, in evaluating the circumstances of the Company, may elect to pay dividends and/or expand operations. Shams Merchant, President and CEO, Intellibidder Corp.
Mr. Shams Merchant is the original inventor behind the novel and proprietary technology that is the basis of the Intellibidder Platform. Mr. Merchant is currently the head of the Merchant Group of Companies, a global venture and consulting firm, and been in business for over 35 years with multiple successes. Mr. Merchant has worked at the intersection of technology and e-commerce for the past 10 years, with his companies servicing Fortune 500’s world-wide. For Intellibidder, he serves as President and Chief Executive Officer. For the benefit of Intellibidder, while serving in a management capacity Mr. Merchant does not intend to draw any salary or other compensation. You should be aware that an investment in Units of the Issuer, and the Issuer's investment in Company Securities, involves considerable risks, including the possible loss of all or a material portion of your investment. Securities sold through private placements are not publicly traded and are intended for investors who do not have a need for a liquid investment. The abbreviated risks set forth below, as well as the detailed risk factors set forth in the Private Placement Memorandum and Supplement, are not the only risks facing investors. The abbreviated risks set forth below, as well as the detailed risk factors set forth in the Private Placement Memorandum and Supplement, are not the only risks facing investors. Early-stage company with an unproven business model, a new and unproven enterprise technology model and a short operating history, which makes it difficult to evaluate current business and future prospects and may increase the risk of your investment. As an early-stage company there are no employee records or compensation programs in place with management. The lack of contracts with employees means undefined employer-employee relationships; i.e. there are no workplace policies available to guide appropriate or inappropriate behavior within the business, as well as compensation. This could have negative implications for human resources. The difficulties Company faces in managing rapid growth in personnel and operations. The rapidly changing technological, social, economic and regulatory developments that requires a wide-ranging set of expertise and intellectual capital. For the Company to successfully compete and grow, it must retain, recruit and develop the necessary personnel who can provide the needed expertise across the entire spectrum of its intellectual capital needs. Competitors may be much larger than the Company, have better name and/or brand recognition than the Company, and have far greater financial and other resources. The Manager and USCGS are affiliated entities. Charles Towle is Co-Managing Partner of the Manager, the Division Head and licensed principal of USCGS, and an indirect stockholder of the Manager and USCGS. Jeffrey Sweeney is Co-Managing Partner of the Manager and is also Chairman, CEO, and the indirect controlling stockholder of the Manager and USCGS. Conflicts of interest may arise in connection with Mr. Towle’s and Mr. Sweeney’s control of both the Manager and USCGS. Investors should be aware that these conflicts of interest, and a number of other conflicts of interest relating to the Manager and its affiliates, are permitted under the terms of the Fund’s offering documents. You should not invest in the Fund unless you are willing to accept these conflicts of interest and the associated risk.